August 4, 2012 - A former Navy sailor who worked in military law enforcement is expected to make his initial appearance in federal court Monday afternoon on charges he attempted to smuggle more than four pounds of methamphetamine out of the United States packaged to resemble a well-known brand of candy bar. Rogelio Mauricio Harris, 34, was taken into custody by special agents with U.S. Immigration and Customs Enforcement (ICE) Homeland Security Investigations (HSI) at Los Angeles International Airport (LAX) as he prepared to board a flight to Japan. According to the criminal complaint, at the time of his arrest Harris was traveling on an improperly retained official government passport that had been issued to him by the U.S. Navy. The complaint states that Harris was discharged from the Navy in August 2011. Harris' arrest came after officers with U.S. Customs and Border Protection (CBP) conducting routine baggage inspections became suspicious of what appeared to be a large box of candy bars inside his checked luggage. Upon closer inspection, CBP officers discovered the 45 individually wrapped, full-sized "candy bars" which contained a white substance that was subsequently determined to be methamphetamine. According to the criminal complaint, each bar "was coated in a chocolate-like substance to make the contents of the package appear to be a real candy bar." "This seizure is a great example of the enforcement work that CBP officers perform every day at our ports of entry, to not only keep illegal contraband and illegal criminal proceeds from entering the country, but from leaving the country as well," said Todd C. Owen, CBP director of field operations in Los Angeles. "Our officers were diligent in their border security duties and prevented over four pounds of methamphetamine from making it to Japan." Harris is charged in a federal criminal complaint with possession of methamphetamine with intent to distribute. The charge carries a mandatory minimum penalty of 10 years in prison and a maximum penalty of life in prison. The case is being prosecuted by the U.S. Attorney's Office for the Central District of California. "This scheme involved considerable planning and preparation and it shows the lengths to which smugglers will go in an attempt to elude detection," said Claude Arnold, special agent in charge for HSI Los Angeles. "The fact this ruse was detected should serve as a deterrent for others who might be considering trying similar tactics to conceal dangerous contraband." 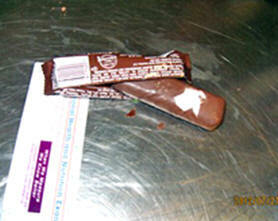 The phony candy bars contained approximately 1,900 grams or just over four pounds of methamphetamine. HSI special agents say the seized contraband would have sold for as much as $250,000 on the street in Japan. HSI's probe into the methamphetamine smuggling scheme is ongoing. Investigators say the imposter candy bar packaging is just the latest ruse employed by smugglers trying to transport illegal drugs through LAX. Other recent attempts have involved concealing the contraband in Easter eggs, snack food bags and cans of refried beans.